Adolf Hitler and the "Annihilation of the Armenians"
Hitler, it seems, was a student of history. 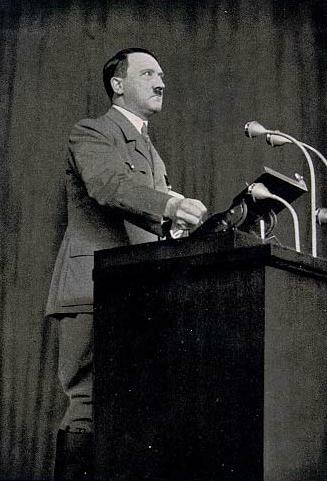 During World War II, he ordered the murder of 10 million Jews, Romani, and others not perfect enough for his racially pure super-society. But it was not the first time. It had happened before - to the Armenians in the Ottoman Empire during World War I. In 1915, the Turkish government planned to eliminate the minority ethnic Armenians from the lands of the Ottoman Empire. An ancient people, with their own language and culture, the Armenians for the most part had tried to live peacefully with their Turkish rulers. But in the mass nationalism of World War I, the Turks planned and executed one of the most brutal genocides in history to achieve "Turkey for the Turks." 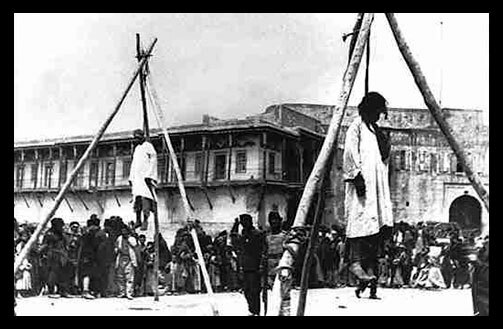 The leaders of the Armenian communities were executed suddenly and without cause. The remainder of the population was deported to Syria and Macedonia. They were force marched under horrible conditions with no provision for food and water. The plan was that few Armenians would reach their destination. Few did. Most of those who did not die of starvation, died of disease. After their defeat in World War I, the new Ottoman government tried the leaders of the genocide and sentenced them to death in absentia. However within a few months the proceedings were suspended and the matter dropped. The survivors were not allowed to return to the Armenian plateau, and few Armenians live today in their traditional homeland. It was a "successful" genocide. Although many tried to help the Armenians, the international community failed to act to hold those responsible accountable. In 1931 Hitler discussed with Richard Breiting the need for massive resettlements (deportations). He said "We intend to introduce a resettlement policy. Think of the biblical deportations and the massacres of the Middle Ag es...and remember the extermination of the Armenians. One eventually reaches the conclusion that the masses of man are mere biological plasticine." History does tend to repeat itself when we don't learn it's lessons, and sometimes someone like Hitler comes along who counts on us being "mere biological plasticine." an excellent account of the "forgotten genocide"